No matter the issue—whether it’s marriage equality, voting rights, health care, or immigration—the U.S. federal courts play a vital role in the lives of all Americans. 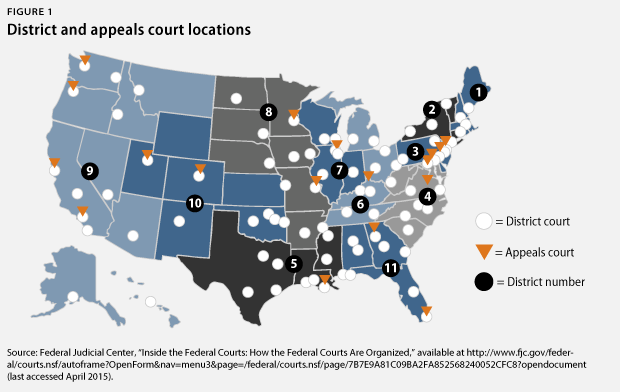 There are two types of courts: state and federal. The federal courts are those established to decide disagreements that concern the Constitution, congressional legislation, and certain state-based disputes. Although most Americans are familiar with the lifetime appointment of justices on the U.S. Supreme Court, many are surprised to learn that more than 900 judges have lifetime appointments to serve on lower federal courts, where they hear many more cases than their counterparts on the Supreme Court. Each year, the Supreme Court reviews around 100 of the most significant cases out of the nearly 30 million cases resolved by state and federal courts. These courts hear the majority of cases and, most of the time, they have the final say. That is why, along with the Supreme Court’s justices, the judges who sit on the nation’s federal district and circuit courts are so important. At any given time, there are vacancies on U.S. federal courts that need to be filled. If they are not filled, federal caseloads get backlogged, and as a result, Americans’ access to justice is limited. As of March 9, 2015, there were 50 current vacancies on U.S. federal courts. These seats have been vacant for a total of 22,222 days, resulting in a backlog of 29,892 cases. The Constitution dictates that the president appoints federal judges while the Senate advises and consents on these appointments. The result is a delicate balance between the desires of the White House, deference to home-state senators, and the power of the party that controls the Senate. 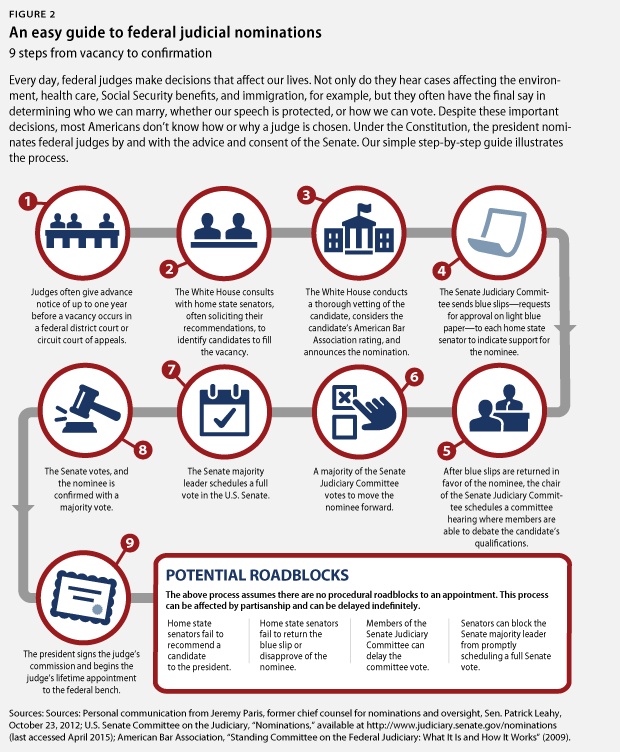 Recently, politics has played a big role in the pace at which judicial nominees are confirmed. 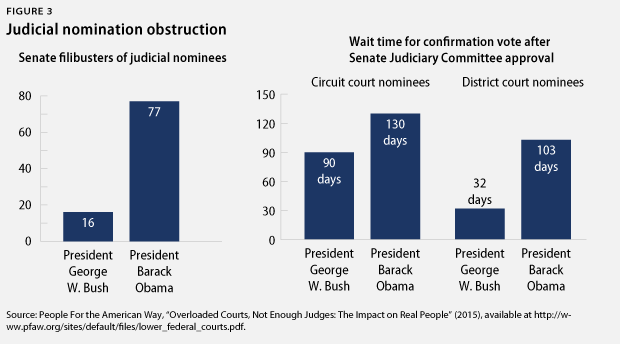 In an attempt to slow President Barack Obama’s effect on the federal courts, Senate Republicans have obstructed the president’s judicial nominees at unprecedented levels by attempting to prevent or delay a vote through filibustering a record number of nominees and making them await confirmation for long periods of time. The reason many Senate Republicans have played politics with President Obama’s judicial nominees is because they know the dramatic impact the judiciary can have on policies, including marriage equality and reproductive choice. The fewer judges that President Obama appoints to fill federal judicial vacancies, the greater leverage the next president will have in deciding the make-up of these courts. Furthermore, scholars have found that judges often change their minds during the deliberative process. In one study, researchers concluded that having a woman on the panel affected “elements of both deliberation and bargaining—alternative perspectives, persuasive argument, and horse trading.” Not only do the federal courts play a vital role in preserving democracy, but who sits on the courts has an effect too. This issue brief examines the ways in which our federal courts influence important policy issues and illustrates how judges’ decisions are often aligned with the legal philosophy of the presidents who appoint them. This fact drives home one of the reasons why courts matter: The decisions of federal judges have repercussions on people’s lives. Through its review of how the federal courts affect three specific policy issues—gun violence, money in politics, and voting rights—this issue brief shines a light on how important the federal courts are for the progressive community. Gun violence has become all too familiar in America. However, research shows that reasonable gun control efforts decrease its occurrence. In particular, the Center for American Progress has determined that there is “a clear link between high levels of gun violence and weak state gun laws,” and that “the 10 states with the weakest gun laws collectively have an aggregate level of gun violence that is more than twice as high—104 percent higher, in fact—than the 10 states with the strongest gun laws.”In short, evidence shows that with more guns, there are more gun deaths. U.S. federal courts play a significant role in determining whether states can impose reasonable gun regulations. For 70 years, the Supreme Court never took a case that dealt with the Second Amendment and the right to bear arms. But in 2008, in District of Columbia v. Heller, five Supreme Court justices appointed by Republican presidents changed course, holding that the Second Amendment protects an individual’s right to possess a firearm unconnected with militia service. Four justices appointed to the Court by Democratic presidents disagreed. Less than one day after the decision, gun rights activists began to flood courts with lawsuits that challenged any and all gun regulations. 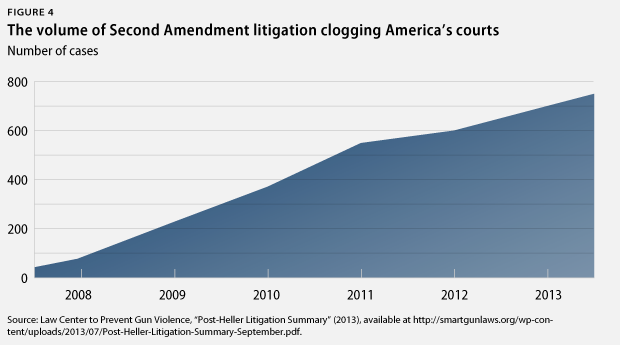 According to the Law Center to Prevent Gun Violence, since the Heller decision, federal and state courts have issued more than 700 decisions on Second Amendment challenges. In many of these cases, judges appointed by Republican presidents have struck down gun regulations, while judges appointed by Democratic presidents have interpreted the Supreme Court’s decision less broadly and upheld them. For example, there is an ongoing debate over the states’ right to impose regulations on applicants for concealed-carry permits. Prior to Heller, many states required a permit applicant to show “good cause” or a “justifiable need” to carry a gun in public. After reviewing these common-sense laws, panels of the U.S. Courts of Appeals for the 7th and 9th Circuit struck them down. This case involves California’s “presumptively lawful” and longstanding restrictions on carrying concealed weapons in public and, more specifically, an even narrower question: the constitutionality of San Diego County’s policy of allowing persons who show good cause to carry concealed firearms in public. When we examine the justification provided for the policy, coupled with Heller‘s direction, our conclusion must be that the County’s policy is constitutional. Unfortunately, the majority never answers the question posed. Instead, in a sweeping decision that unnecessarily decides questions not presented, the majority not only strikes down San Diego County’s concealed carry policy, but upends the entire California firearm regulatory scheme. The majority opinion conflicts with Heller, the reasoned decisions of other Circuits, and our own case law. Therefore, I must respectfully dissent. As Judge Thomas noted, other courts have upheld state laws that promote public safety. Judges on the Courts of Appeals for the 2nd, 3rd, and 4th Circuit have found that laws requiring permit applicants to show “good cause” do not interfere with the Second Amendment and instead promote balancing gun use with safety. In each of the decisions, judges appointed by Democratic presidents upheld longstanding permit regulations that are utilized by states across the country. America’s representative democracy rests on the notion that elected officials are responsive to the people who elect them. Currently, however, political campaigns and elections are dominated by large amounts of money from individuals, corporations, and special interests that politicians rely on to run for office. During the 2014 election cycle, mega-donors dominated spending, with the top 100 campaign donors pouring in nearly enough money to match some 4.75 million small donors combined. [xxvi] The Center for Responsive Politics found that “just 666,773 individuals had donated more than $200 to campaigns, parties and political action committees in the 2014 election cycle.” This means that only 0.2 percent of the population financed the midterm elections. Why has the United States seen such an expansion of special interest money in its electoral system? One does not have to look much further than the federal courts. 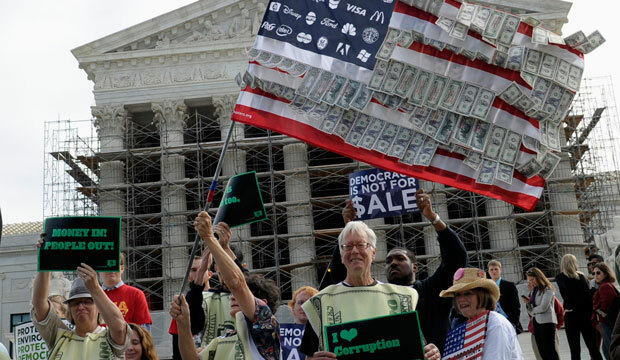 In a series of high-profile decisions, the Supreme Court has turned campaign finance law upside down. In a 1976 case known as Buckley v. Valeo, the Supreme Court determined that spending money for political campaign purposes was a form of speech protected by the First Amendment. This money-is-speech rationale was used to strike down portions of the campaign finance reforms that followed the Watergate scandal. It has also been used to open the floodgates for more money in politics. In the now infamous Citizens United v. Federal Election Commission, five justices appointed by Republican presidents held that, although entities such as corporations could not contribute directly to individual political campaigns, they could contribute unlimited amounts of money to independent political action committees, or PACs. This decision caused an “explosion of political money,” epitomized by the continued growth of super PACs—independent entities that can raise unlimited amounts of money from corporations, unions, and individuals but are prohibited from coordinating with a political candidate’s campaign. The Supreme Court continued to loosen restrictions on campaign funding in McCutcheon v. Federal Election Commission, in which the same five justices appointed by Republican presidents struck down the aggregate campaign contribution limits, which restricted how much money a donor could contribute to all candidates for federal office combined. The Court held that this limitation was a violation of the First Amendment. These two opinions bookend the campaign finance revolution that has taken place under Chief Justice John Roberts. All told, the Roberts Court has struck down seven campaign finance regulations. In the years of Jim Crow and segregation, voters faced overt challenges to their right to vote, including grandfather clauses, poll taxes, literacy tests, and blatant intimidation and violence. In response to these oppressive and undemocratic practices, legal protections, such as the Voting Rights Act, or VRA, of 1965, were passed in order to help ensure that eligible voters could exercise their right to vote. The VRA has been called the nation’s most powerful civil rights law. However, as a nation, we are still far from ensuring that all Americans have equal access to the polls. According to the Brennan Center for Justice, in 2013 alone, 33 states introduced at least 92 restrictive voting bills. On top of that, researchers found that higher voter turnout among minorities in a given state increased the likelihood that the state would propose restrictive voting laws. These restrictive measures have been found to have a disproportionate effect on people of color, those for whom English is a second language, young people, the indigent, and the elderly. U.S. federal courts play a large role in enforcing the laws that protect voters from discrimination and intimidation. In 2013, in Shelby County v. Holder, five Supreme Court justices appointed by Republican presidents gutted the VRA by ruling that the formula stipulated in Section 4(b) to determine which states were subject to Section 5 “preclearance” before the implementation of changes to state or local voting laws was unconstitutional. The ruling made it harder for the federal government, including the courts, to hold states accountable for discriminatory voting practices. The four justices appointed by Democratic presidents wanted to keep the VRA protections in place. Although Shelby County was a setback for voters, other sections of the VRA still exist and are being used to fight voting-related discrimination and to require states to provide appropriate assistance to large populations of eligible voters that speak foreign languages. Recently in Texas, a federal judge who was appointed by a Democratic president determined that the state’s new voting law intentionally discriminated against communities of color, violated the VRA, and constituted an unconstitutional poll tax that could disenfranchise nearly 600,000 registered Texans. For this reason, America’s federal courts will continue to determine how to apply these protections in order to help ensure that all voters have an equal right to vote. In 1929, legendary civil rights lawyer Charles Hamilton Houston said, “A lawyer’s either a social engineer or … a parasite on society.” He described a social engineer as “a highly skilled, perceptive, sensitive lawyer who [understands] the Constitution of the United States and [knows] how to explore its uses in the solving of problems of … local communities” and in “bettering conditions of the underprivileged citizens.” In this light, Houston believed that lawyers should use their training and their prestige in the community to better society and to promote justice. When articulating the ideal temperament of a judge, President Obama evoked Houston’s sentiments by listing “empathy” as a key trait. Collectively, this means that judges must understand the real-world implications of legal decisions. This is a critical ability because the federal courts have an impact on every issue that affects Americans’ daily lives. U.S. federal courts ensure equality, defend civil rights, protect the environment, affect the health of America’s democracy, and keep the nation safe. While Americans often feel that the federal courts are untouchable, it is important to know that they can play a large role in how these courts rule, as those responsible for filling the benches of U.S. federal courts are responsive to the democratic process and the input of American citizens. Presidents nominate judges who share their beliefs and values. And because they serve for life, federal judges have a huge impact on the issues that affect the lives of all Americans. Control of the Senate also matters, as senators are responsible for confirming or rejecting the president’s nominees. Senators play a large role in identifying lawyers for the White House to nominate and can control the pace of the nomination process. The first step in the process toward confirming judges who understand the real-world implications of legal decisions is to continue working to appoint judges who meaningfully reflect America’s diverse experiences. The United States needs its courts to be staffed with Houston’s social engineers—those who faithfully adhere to the rule of law but who are equally faithful to their constitutional obligations to promote justice and fairness. Instead of siding with ideological pursuits, America’s judges must uphold the Constitution and the nation’s laws. Michele Jawando is the Vice President of Legal Progress at the Center for American Progress. Sean Wright is the Policy Analyst for Legal Progress at the Center.